I remember a story of two guys both driving in thick fog. Fog so thick that they were driving slowly with their heads out the window trying to see…. and bumping heads! It sounds silly, crazy even, but how many of us keep pushing on at work or in our business when we are struggling with brain-fog. You know, that feeling that you have trouble focusing or struggling to think of anything! It’s hardly going to end with an amazingly positive outcome is it!?! I have a confession to make – I’ve been floating in brain fog (and the flu) since the start of the month. My productivity is pathetic, but its hard to stop and regroup. There’s always a meeting, or something that needs doing. Or so we tell ourselves. It’s my dedicated work ethic … or not wanting to “waste” precious holiday time… Perhaps not sick enough to need a sick day, but definitely presenteeism. And yet, I think we all know that if we actually listen to what our brains and bodies are telling us, we’d actually take that break. Not keep hanging out until the holidays, but take a break RIGHT NOW! Whilst I’m sure that most employers (and even those of us self-employed) baulk at the idea of even more time “off”, perhaps its a more productive approach – a way of clearing the mind and resetting ourselves without time out that is needed. So far I’ve done about half of these, and my mind is already feeling clearer – ready to make action plans for the week and the future! Once you are feeling clearer, it’s a great time to start planning your actions for the week! And of course, making sure these aren’t just random actions, but aligned (that strategy thing) to the goal I am working towards. What if my actions don’t align? Okay, sometimes it’s a bit like working in the finance department of a big corporation – hard to see how what you do contributes to the success of the organisation. And worse when we aren’t thinking clearly! Sometimes our actions are the foundations we need in order to run our business or to deliver a customer outcome. But sometimes (and these are the ones to watch for), we just fluff around with things we might like doing or think we should be doing, but don’t really add value. Once we have cleared our minds, we should be able to question ourselves on each task and make sure it really is important to the business. For example, are you doing something because you always do it, because it seems like a good idea, or perhaps because somewhere at sometime, someone asked for it? 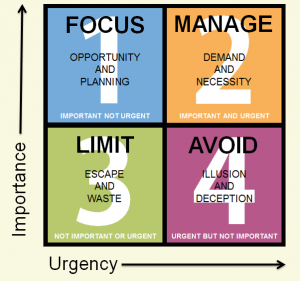 Using the Eisenhower Urgent Important matrix (sourced from https://blog.innerdrive.co.uk/using-your-scarcest-resource-wisely) is a great way to identify where you should be focusing your time. Particularly when we often use the sense of Urgency to drive our behaviour, rather than using our time most effectively in the Important Not Urgent zone. But without clear thinking, it’s almost impossible to differentiate and choose wisely. Clear decisions require clear minds! Of course, I’d still recommend taking an actual rest-break if you can – find someone to mind the kids for a few hours if you need to – and JUST HAVE A REST. Not reading or screen-time, just rest your whole self. Be kind to yourself and your productivity, motivation and clarity of mind will return! …And then choosing our actions to be time and productivity efficient becomes easier.. I think I might book in a break myself.